Bronx bartender Michael Moriarty was feeling bored at the laundromat, so he took a walk which led him to the Woodlawn Gift Shop on Katonah Avenue near 237th Street. At the store which was just a block from the laundry, he bought a $25 Cash Blowout ticket in a spur of the moment decision. And that was when his life changed for the better. 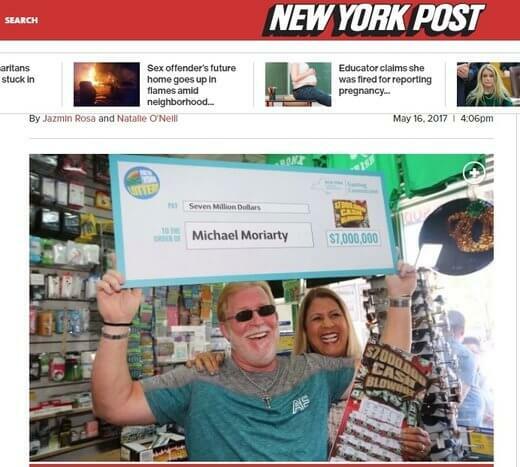 When he scratched the ticket he discovered that he had won the $7 million top prize, which literally took his breath away so he had to bend over and grab his knees. When asked to verify, even gift shop worker Mohamed Albasir was overcome by emotion. Moriarty, who has been preparing drinks for the past 40 years, has not given any indication he plans to quit working. There are hints he will treat his co-workers to a celebratory drink or two though. The winner says he is a simple man and all he wants for himself at the moment is a new fishing pole and perhaps to travel with his daughters. He also hints that the bulk of his winnings will be spent taking care of family.